The FED was introduced in 1934 by the socialist factory of the Dzerzhinsky Commune in Kharkov, Ukraine, then a part of the USSR. FED are the initials for F. E. Dzerzhinsky, the founder of the NKVD, the Soviet Ministry of the Interior, later known as the KGB, in honour of whom the camera is named. The factory workforce was based on youths living and working together in a commune. The FED is a true copy of the Leica II, itself only introduced less than two years earlier. As with many early Leica copies, the fact that Leitz utilized non-metric production equipment escaped most of the early camera manufactures, the consequence being slightly finer thread pitch of the 39mm lens mount, of which the FED is an early example. The flange to film plane distance, which Leitz standardised in 1932, also differs slightly on the early FED cameras. Each lens had to be matched to the camera for correct focusing. Later production FED cameras from 1950s were given lens mounts with the correct LTM pitch, and most can be found with the proper lens register as well. The variations in the engravings on the camera tops make it worth a special mention, reflecting the changes within the Soviet Union. 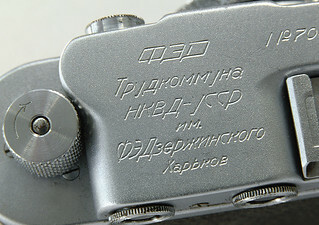 The inscriptions are in Cyrillic, delicately engraved on top of the finder housing. One of the most often occurring words, apart from FED and Dzerzhinsky, is TRUDKOMMUNA meaning labour community, while IM is short for named after. At the base OTKP means open, and 3aKP means close. 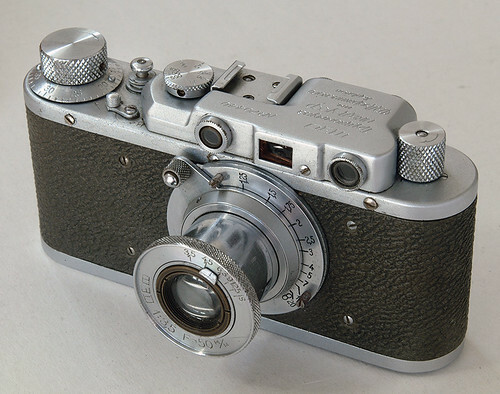 From early on, a few oddities exist as well, including a counterfeit Leica II, discovered by the German army when occupying the Kharkov factory in 1941. However, the finish alone reveals the forgery. When camera production resumed in 1946 the NKVD engravings were replaced by a simple Cyrillic FED logo on the top. This version is known as the FED 1. The FED was continuously improved and produced in great quantities until 1955 at which point production of the FED 2 series commenced. Considerable effort has been put in to revealing the story about this fascinating camera, and it is well documented and covered in articles and books. Special mention of Oscar Fricke, whose findings were published already in 1979, should suffice here. This page was last edited on 21 November 2016, at 06:20.